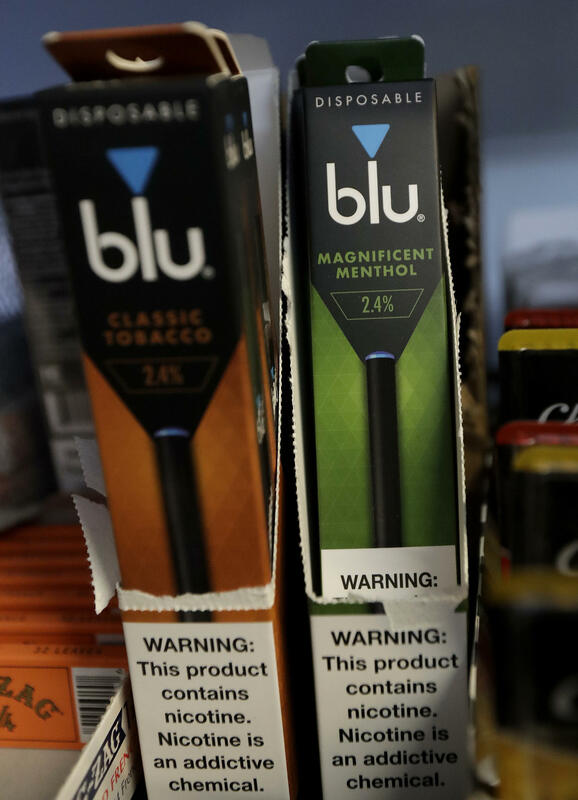 This May 17, 2018 photo shows packs of blu menthol electronic cigarettes displayed with other tobacco products at Ted's Market in San Francisco. Supporters of the measure argue that the use of e-cigarettes — or vaping — is behind a big spike in teen tobacco use. Studies show that 1 in 5 Maine high schoolers are using these flavored products, which often taste more like candy than tobacco. Dr. Jonathan Fellers, an addiction specialist with Maine Medical Center, supports the measure. “The rate at which youth in Maine are becoming addicted to electronic nicotine products is pretty staggering. We believe that LD 1190 takes an important step forward in helping to curb e-cigarette use among children,” he says. Opponents argue that a ban will hurt the many businesses that sell flavored products to adults. One testified that the state could lose $25 million a year in tax revenue. Opponents also argue that tough sale and possession penalties are a more targeted approach to solving the underage tobacco use problem.